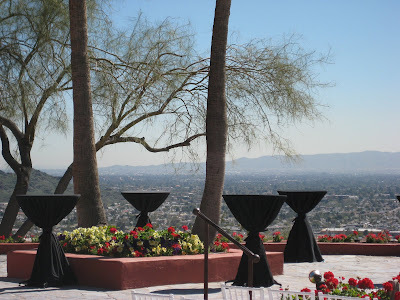 Yesterday I visited the Different Pointe of View restaurant at the Pointe Hilton Tapatio Cliffs Resort in Phoenix. They just did over $750,000 of recent enhancements to the restaurant and it is expected that the classic venue is going to be a huge local and regional wedding destination. Whether you are inside the restaurant where there are floor to ceiling windows or on the outdoor patio, you get to see 360 degrees of breathtaking views. 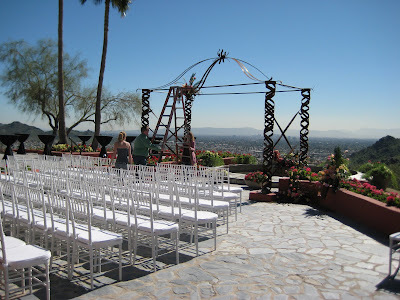 There was a wedding ceremony set up on the outdoor patio yesterday (picture above) which made the vision of a wedding there more of a reality. What a great atmosphere for a wedding!